During her brief but prolific career, Mendieta created groundbreaking filmworks marked by both boldness and sensitivity. Through short actions often staged in natural settings, the artist's body or its traces undergo elemental transformations, fading back into the land or igniting in a shower of sparks and smoke. All works courtesy The Estate of Ana Mendieta Collection, LLC, and Galerie Lelong & Co.
"My art is grounded in the belief of one universal energy which runs through everything: from insect to man, from man to spectre, from spectre to plant from plant to galaxy. My works are the irrigation veins of this universal fluid. Through them ascend the ancestral sap, the original beliefs, the primordial accumulations, the unconscious thoughts that animate the world." - ‘A Selection of Statements and Notes’, Sulfur, vol. 22, 1988, 70. 2014 artevida: a City wide contemporary art exhibition: artevida (corpo), Casa França-Brasil, Rio de Janeiro, Brazil. Other sections: artevida (política), Museu de Arte Moderna do Rio de Janeiro, Rio de Janeiro, Brazil; artevida (arquivo), Biblioteca Parque Estadual, Rio de Janeiro, Brazil; artevida (parque), Escola de Artes Visuais do Parque Lage, Rio de Janeiro, Brazil. 2012 Explosion! Painting as Action, Moderna Museet, Stockholm, Sweden; Fondació Joan Miró, Barcelona, Spain. Territories of Desire: Surfaces of Desire, Museo Universitario Arte Contemporaneo (MUAC), Mexico, D.F. 2009 Elles: Women Artists in the Collection of the Centre Pompidou, Centre Georges Pompidou, Paris, France; Seattle Art Museum, Seattle ; Centro Cultural Bando do Brasil, Rio de Janeiro ; Centro Cultural Banco do Brasil, Belo Horizonte. Mexico: Expected / Unexpected: Collection Isabel et Agustín Coppel, La Maison Rouge, Paris, France; TEA Tenerife Espacio de las Artes, Tenerife, Spain; Stedelijk Museum Scheidam, Scheidam, The Netherlands; Museum of Contemporary Art San Diego, San Diego, California; Museum of Latin American Art, Long Beach, California; American University at the Katzen Arts Center, Washington, DC. Currents: Recent Acquisitions, Hirshhorn Museum and Sculpture Garden, Washington, D.C.
Streetworks, Washington Project for the Arts, Washington, D.C.
Latin American Sculptors of the U.S., Fondo del Sol, Washington, D.C.
Oransky, Howard, ed., Covered in Time and History: The Films of Ana Mendieta, Minneapolis: Katherine E. Nash Gallery at the University of Minnesota, in association with University of California Press, 2015. Rosenthal, Stephanie, ed., Ana Mendieta: Traces, London: Hayward Publishing, 2013. 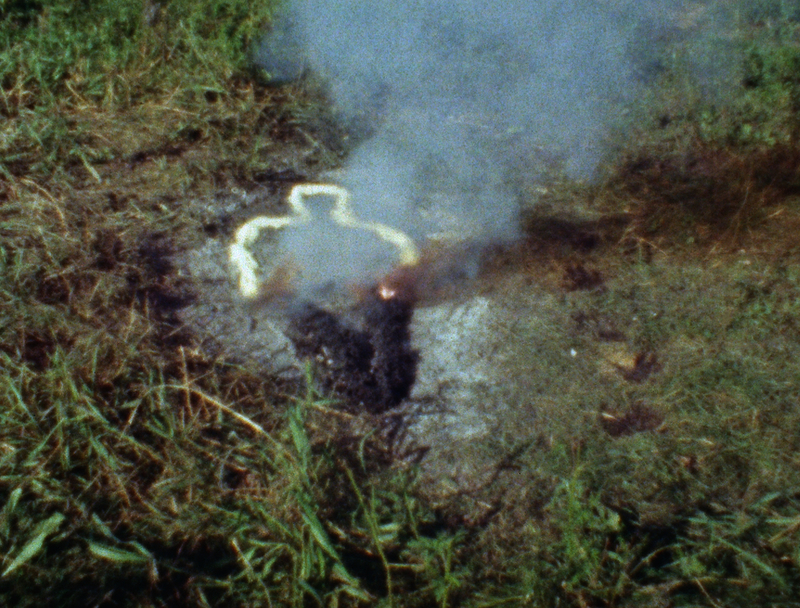 Merz, Beatriz, Ana Mendieta: She Got Love: Skira, 2013. Ana Mendieta: Blood and Fire, Paris: Galerie Lelong, 2011. Viso, Olga M., Unseen Mendieta, Munich, Berlin, London, New York: Prestel, 2008. Viso, Olga M., Ana Mendieta: Earth Body, Ostfildern-Ruit, Germany: Hatie Cantz, 2004. Ana Mendieta, Santiago de Compestela: Centro Galego de Arte Contemporanea, 1996. Ana Mendieta: 1948 - 1985, Helsinki: Helsinki City Art Museum, 1996. Clearwater, Bonnie, Ana Mendieta: A Book of Works, Miami: Grassfield Press Inc., 1992. Jacob, Mary Jane, Ana Mendieta: The Silueta Series, 1973-1980, New York: Galerie Lelong, 1992. Ana Mendieta: A Retrospective, New York: The New Museum of Contemporary Art, 1987.